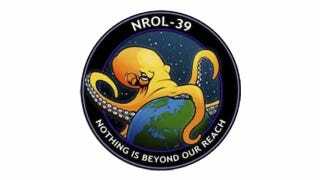 The National Reconnaissance Office used this definitely-not-evil octopus mission patch for their satellite launched last night. The Popular Science website put up a gallery of other globe straddling octopuses (or octopi or octopodes)* and other multilimbed cephalopods. And my favorite, Standard Oil octopus. See the rest at PopSci. *The video will explain the different plural forms of octopus.